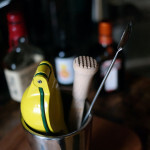 Stocking a kitchen can cost thousands of dollars in pots, pans, knives, and various utensils, but you can mix cocktails like a pro for $50 (or, if you want to invest more after you have mastered the basics, there are great vintage items out there that can up your game to a whole new level)! Boston Shaker: Forget the three-piece cobbler shakers (the cup, with strainer top, and cap), and get a standard boston shaker. It is simply a large metal shaker that fits onto a standard 16 oz. pint glass. The two parts are versatile, since it can be used for stirred or shaken drinks, and a line of glasses can be setup to make a number of drinks at once. These are barroom workhorses that professionals rely on for a number of reasons, including their price … under $10. Strainer: Many use a traditional Hawthorne strainer that fits inside a shaker, but some find that it doesn’t keep enough of the solids out of their drinks. 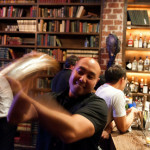 At many upscale bars and speakeasies, bartenders will use a julep strainer (but it takes more practice to use one single-handed, like the Hawthorne). Another option is a small mesh conical strainer, similar to ones used to drain pasta. The mesh strainer is also useful in straining fresh juices and other ingredients before they are added to drinks to enhance their clarity. Even the most expensive strainer shouldn’t set you back more than $8. Jigger: Jiggers are the traditional measures for cocktails, but most people have measuring cups and spoons in their kitchens that work. If you want to get something special, traditional jiggers are hourglass-shaped, double-sided cups with different measurements on each side, often sold in sets. Newer, patented jiggers of different styles are available and, some find them easier to use. Again, less than $10. Bar Spoon: This is not an extravagance! It is the right tool for the job and has several key elements that differ from other pieces of flatware, including its length and the twists on its handle. Cost is less than $8 (really cheap ones are $2). Muddler: There is not much to say about muddlers, they crush things to release their juice and essential oils. What you don’t want is the muddler to come apart, so nothing that is vanished or can shred (aka silicon or other “fancy” materials). What you want is plain, old fashioned hardwood! Fancy woods can cost a lot, but under $10 is easy to find. Finally, one note on those bartender or cocktail tool sets: Don’t Buy! They always have pieces that are superfluous, of low quality, or designed more for looks than use. If you are serious about making cocktails, then buy exactly what you need and nothing more.